Synthetic peptide within Human HLA-DPB1. The exact sequence is proprietary. Human fetal thymus and Human tonsil lysates; Human tonsil tissue; Jurkat cells; Immunoprecipitation pellet from fetal thymus lysate. Our Abpromise guarantee covers the use of ab157210 in the following tested applications. WB 1/10000 - 1/50000. Predicted molecular weight: 29 kDa. IHC-P 1/2500. Perform heat mediated antigen retrieval with citrate buffer pH 6 before commencing with IHC staining protocol. Cell membrane. Endoplasmic reticulum membrane. Golgi apparatus, trans-Golgi network membrane. Endosome membrane. Lysosome membrane. The MHC class II complex transits through a number of intracellular compartments in the endocytic pathway until it reaches the cell membrane for antigen presentation. Immunohistochemical staining of paraffin embedded human tonsil with purified ab157210 at a working dilution of 1/2500. The secondary antibody used is ab97051, a goat anti-rabbit IgG (H&L) at a dilution of 1/500. The sample is counter-stained with hematoxylin. Antigen retrieval was perfomed using Tris-EDTA buffer, pH 9.0. PBS was used instead of the primary antibody as the negative control, and is shown in the inset. Immunofluorescent analysis of Jurkat cells labeling MHC Class II with unpurified ab157210 at 1/50 dilution. Immunohistochemical analysis of paraffin-embedded Human tonsil tissue labeling MHC Class II with unpurified ab157210 at 1/100 dilution. Immunofluorescence staining of Raji cells with purified ab157210 at a working dilution of 1/250, counter-stained with DAPI. The secondary antibody was Alexa Fluor® 488 goat anti-rabbit (ab150077), used at a dilution of 1/1000. ab7291, a mouse anti-tubulin antibody (1/1000), was used to stain tubulin along with ab150120 (Alexa Fluor® 594 goat anti-mouse, 1/1000), shown in the top right hand panel. The cells were fixed in 100% methanol and permeabilized using 0.1% Triton X 100. The negative controls are shown in bottom middle and right hand panels - for negative control 1, purified ab157210 was used at a dilution of 1/500 followed by an Alexa Fluor® 594 goat anti-mouse antibody (ab150120) at a dilution of 1/500. For negative control 2, ab7291 (mouse anti-tubulin) was used at a dilution of 1/500 followed by an Alexa Fluor® 488 goat anti-rabbit antibody (ab150077) at a dilution of 1/400. Immunohistochemical staining of paraffin embedded human skeletal muscle with purified ab157210 at a working dilution of 1/2500. The secondary antibody used is ab97051, a goat anti-rabbit IgG (H&L) at a dilution of 1/500. The sample is counter-stained with hematoxylin. Antigen retrieval was perfomed using Tris-EDTA buffer, pH 9.0. PBS was used instead of the primary antibody as the negative control, and is shown in the inset. Unpurified ab157210 showing positiveve staining in human normal colon. Unpurified ab157210 showing negative staining in Human heart. 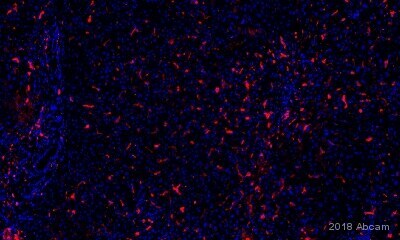 Unpurified ab157210 showing negative staining in Human normal brain. Publishing research using ab157210? Please let us know so that we can cite the reference in this datasheet.